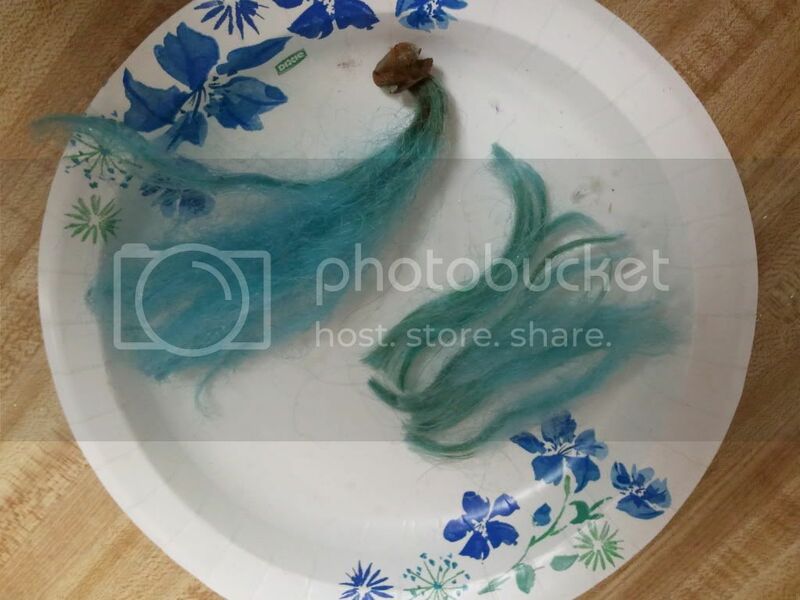 My Little Pony Arena » Forums » Pony Talk » Pony Corral » The value of rehairs: questions/concerns/opinions? Forums » Pony Talk » Pony Corral » The value of rehairs: questions/concerns/opinions? The value of rehairs: questions/concerns/opinions? Would you rather have a G1 with original hair, even if it's damaged? I am okay with frizzy G1 hair but can't stand haircuts. I'm okay with haircuts as long as they aren't very noticeable. I have a few ponies with cut hair and wish they weren't, but I prefer ponies with original hair. I would rather have a pony that has been rehaired than a pony with frizz! I would rather have a pony that has been rehaired than a pony with a haircut! I don't care either way! Posted: 0 Post subject: The value of rehairs: questions/concerns/opinions? So I've been thinking about rehairs. Primarily because I found a Blueberry Baskets at the swap meet, black and grimy with hair so frizzed out and disgusting it was way beyond hope. Unfortunately I didn't get a picture, but Novavelle was with me when I opened it up and shook out a handfull of rust.. yuck! Definitely a bait pony. But then I took her home, cleaned her up really well and realized that her body was pretty much flawless. I knew something had to be done about her hair. even if I straightened out the frizz, I wouldn't be able to fix the fact that the mane was 1/2 its regular length or that it's all stained greenish-brown from the super rust explosion inside. Posted: 0 Post subject: Re: The value of rehairs: questions/concerns/opinions? I prefer original hair, cut, frizzy, or faded, but I'm pretty tolerant of most flaws on my ponies, even cancer...they're used toys after all. 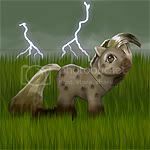 That said, I will and have rehaired ponies if they're especially bad (like my nearly-bald Skydancer), although so far, only with donor hair. So, yeah, I don't mind rehaired ponies, as long as it's the same color, length, type, etc. Otherwise, I consider it a custom. As much as I prefer original hair, it's easily-replaceable enough that it's not a huge deal to me, especially since we have access to the actual supplier. I 'm not a picky collector so I don't care either way. I think the only time it would matter to me is if I wanted to sell the pony. Even then it would be a matter of the rarity/popularity/general condition of the pony. I think it's all about personal preferences. For me, I like ponies with short to medium length hair. If it's too long, it tangles up too much for me and I can't style hair at all. Your BB looks adorable with her new hair. 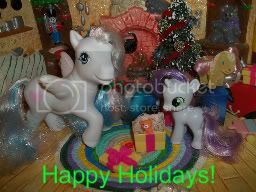 The only pony I have with cut hair is baby Cherry Jubilee, but it's only about a half-inch cut... and that was when I was new to collecting and didn't think about haircuts too much. I don't mind her, but from then on (and now) I collect ponies with their original uncut hair, faded, frizzy, or whatever- as long as it's original. haha, I knew someone was going to mention that. Damn, that's some long hair! yeah, I haven't trimmed it yet and I used a full hank. exactly 1/2 went to the mane and the other 1/2 to the tail. 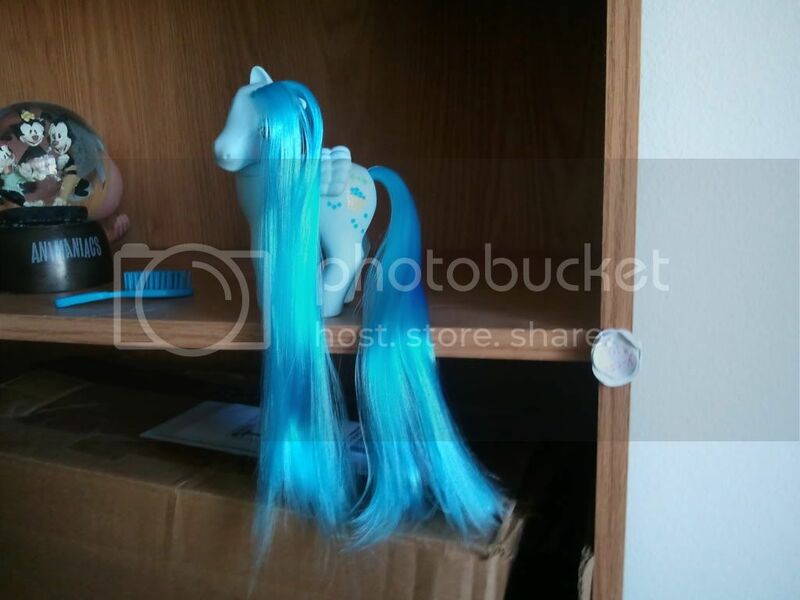 I'm not sure whether or not I'm going to cut it, since I already have this pony and she's therefore a duplicate.. meaning the potential future owner may want it long as it is (just more even), or short and curled as it's supposed to be. Honestly, at the end of the day, they are old-ish toys. Whenever I see a bad haircut on a non-rare pony (not Rapunzel, for example), I think that they deserve some new life. Does that make them custom if I use Dollyhair and not original hair? Even if I use the same colors? Maybe. But I appreciate looking at my re-haired Coco Berry, Banana Surprise, and Seashell. Hey, I like custom variant re-hairs. It's my way of "playing" besides taking my ponies out to admire them every now and then. Like for example, your blueberry basket, she's gorgeous! I guess really depends on people's ways of collecting. I like to have my ponies looking good, so if it's a super rare pony or nirvana that is not in the best condition, I'd personally rather restore it or not have it at all. Off course I would prefer a pony with original hair, but if it has a bad haircut or if it's way too frizzy and dry, I'd definitely have it re-haired in a way to look as similar to the original as possible. I don't care if they've been rehaired, since it gives an old pony a new lease on life. As long as they say upfront that it has been rehaired. Same way I don't care if blush/symbols/eyes have been touched up, because to me that falls under the category of restoration. Not everyone can afford or find a good enough version of whichever pony they're hunting for. Personally I view restoration as a hell of a lot more difficult than customizing, because there is no wiggle room to say 'I meant to do that' or to incorporate happy mistakes into the design. I wouldn't rehair my childhood ponies. i don't MIND frizzy tails, but a frizzy mane would really bug me. 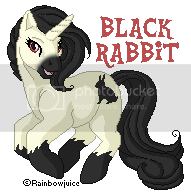 I wouldn't mind a rehair if it meant I could get a pony that would normally be too expensive...and if the rehair was the same length and color. Etc.. I prefer the original hair regardless of the frizz or a cut. Many rehairs, however, do look beautiful (such as yours!!!). I just always prefer the original hair even if the rehairs actually look soooo much better lol! I can live with haircuts on ponies, but I don't like frizzy hair. 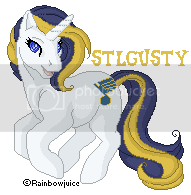 That said, if it's rehaired, I want it to be the same color and texture as the original pony.